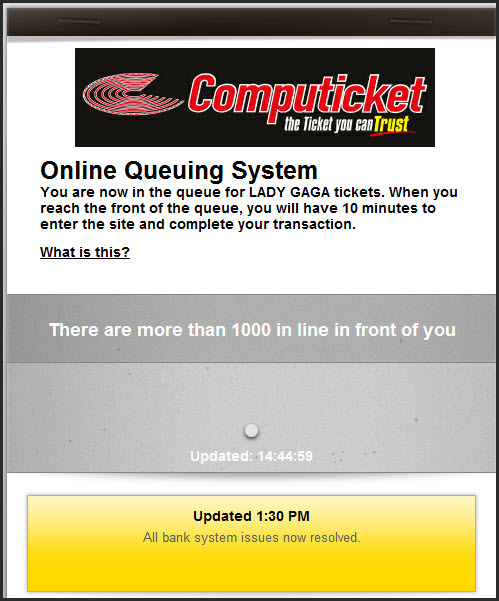 The bookings for Lady Gaga’s tour to South Africa opened today – and as usual, Computicket failed dismally to meet the demand of ticket sales. 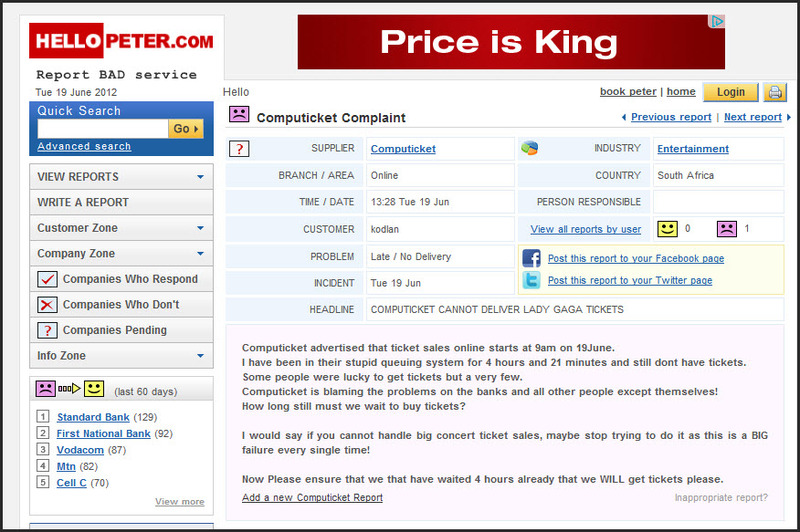 Both Computicket and Big Concerts have Twitter accounts and Facebook fan pages, and people have been inundating both mediums with endless complaints on both mediums for the past 6 hours – and what do both companies do? For the most part, pretend they don’t see the complaints and don’t bother to reply to them. There are SO many posts and SO many complaints, that you’ll have to read them all yourself. This bad organisation landed them on Hello Peter too – one wonders if they even care with the amount of money changing hands for this concert. And we can sympathise – because Computicket’s “new system” is a total train wreck with countless people pushed right back to the end of the queue after waiting for hours. 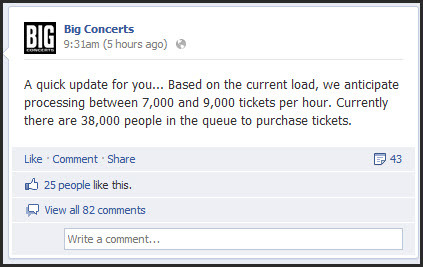 Or being chucked out during the payment process, right back to the end of the queue. All requests to find out where we are in the queue have been ignored. Zero transparency in the process! 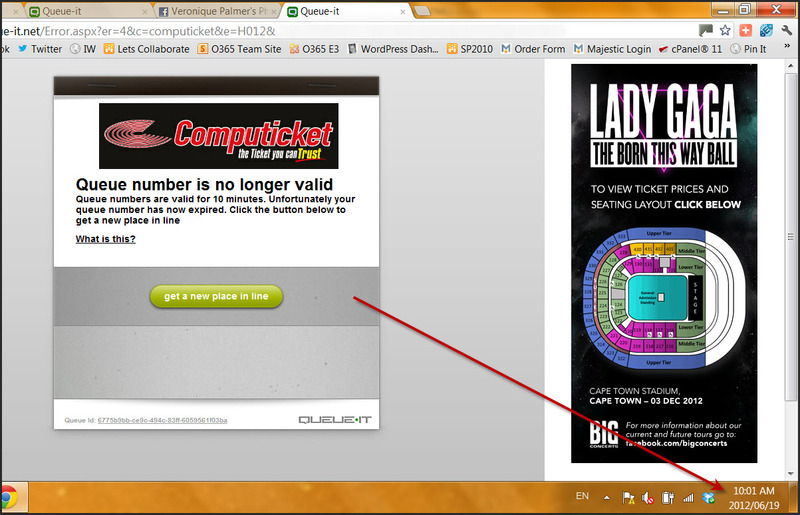 What did Computicket and Big Concerts think was going to happen today? They bring out a megastar that has more than 52million Facebook fans, and 25million Twitter fans; and then don’t have an army of IT people and social media specialists on hand to manage the fall out? This performer is helping elevate South Africa to millions, and Big Concerts and Computicket embarrass it in less than one day with their sheer incompetence. It’s time someone else comes in and takes over big ticket sales from these two. This happens with every concert and it’s not acceptable. These two have today effectively kept 38000 people out of work for hours and hours because they can’t get a booking system right. 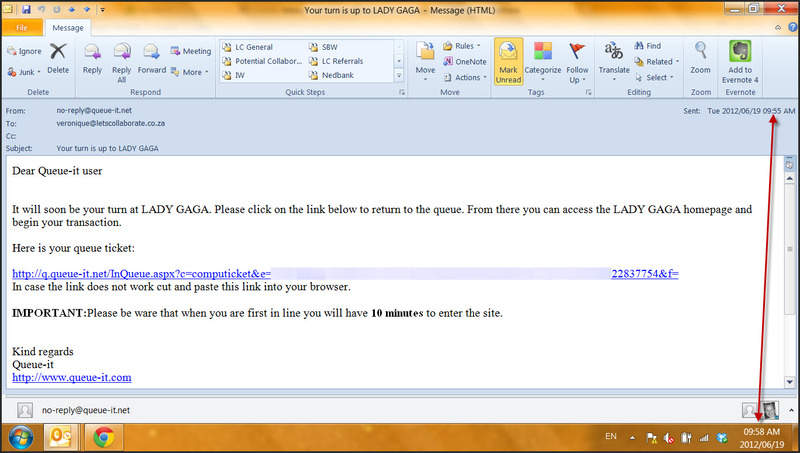 As of right now, I have stopped my business for 5 hours and 45 minutes to get tickets – and still waiting. This after I was sent my confirmation email before 10am this morning, but the system failed and was booted out and to the back, way BEFORE my 10 minutes was up! Just like hundreds of other people. 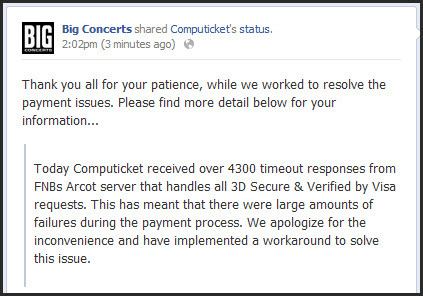 We should be boycotting both Computicket and Big Concerts in future! They do not deserve our business! It amazes me how the companies take all the credit and advertising space to get someone like Lady Gaga out here and brag about it on air – yet, absolutely no responsibility when it all goes wrong. 5FM is also guilty of this – they were all gung-ho to have the breaking news, and where have they been today when thousands of frustrated people? Nowhere! Except commenting on air to ask if people are still queuing. Epic Fail all three of you! Read more complaints on Channel24, Memeburn 1, Memeburn 2, and News24.